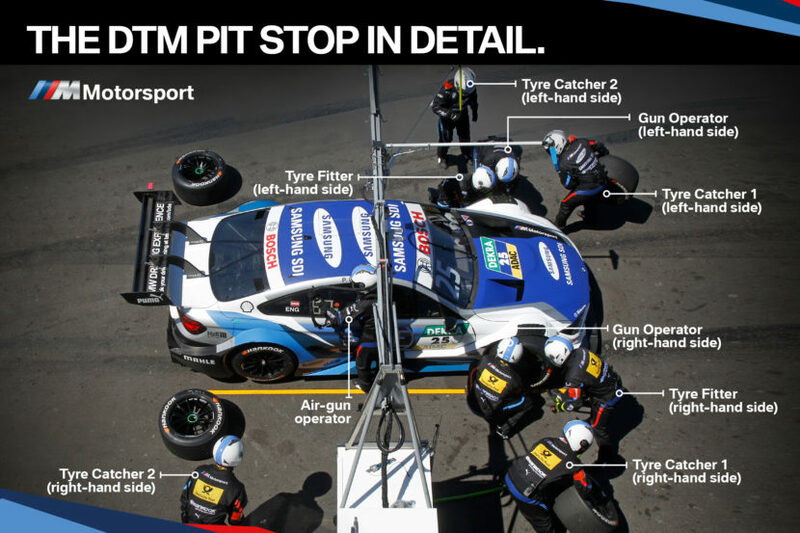 If you’re an avid motorsport consumer, you probably already know that pit stops are quite different depending on a number of factors. Whether you’re watching the DTM or a WTCC or an endurance race, some notable differences can be spotted. It’s not always about changing the tires in the shortest time but it can also be about the procedure itself or switching the drivers. BMW is involved in a number of races and championships and here’s how they are different depending on the format. The pit stops in the DTM are a great mental and physical strain for the whole team, as they can decide the race in the balanced starting field so good preparation and constant pit stop practice is standard procedure for all team members. For the drivers, it is important to get the cool tires (regulations no longer allow preheating) up to the correct temperature as quickly as possible after returning to the track. In this championship the car is stationary for about 7 seconds and no refueling is allowed. Nine team members are working directly on the car while one extra person is at the pit wall, manning the pit board with one person being on the radio and coordinating everyone. “The pit stop is of great significance in the DTM. 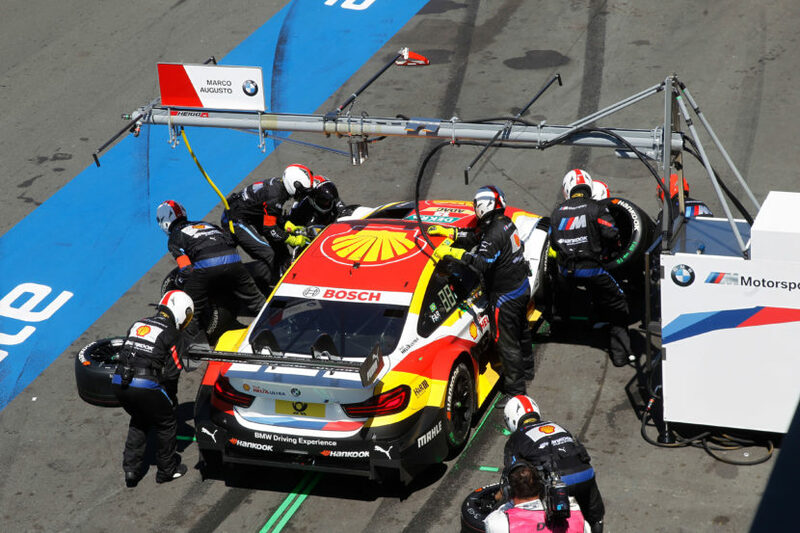 The level of performance in the DTM is very high, which is why the pit crew is important. You always win and lose together. 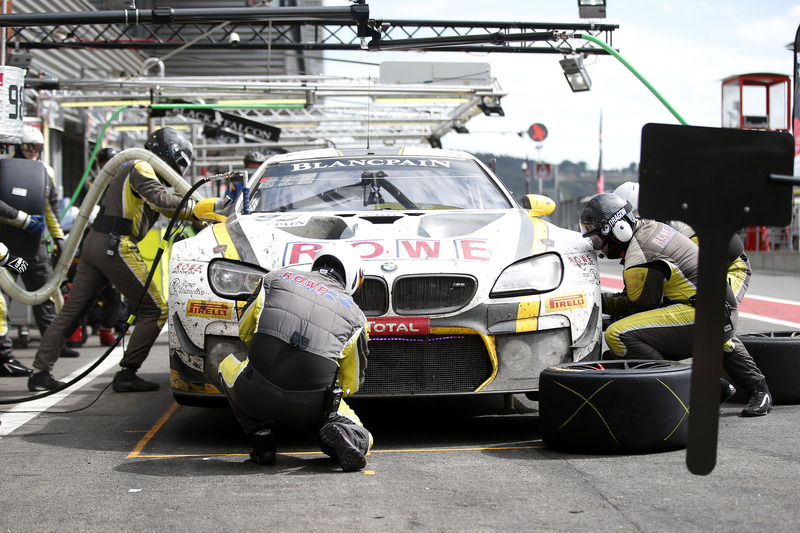 It is important that you brake as late as possible before the pit stop line and don’t waste any time,” says Philipp Eng. In the FIA World Endurance Championship things are a bit different. In this case the BMW M8 GTE is the weapon of choice and the car is stationary for about 35 seconds, depending on the volume of fuel being injected back into the tank. There are 8 people involved: 4 mechanics, 1 lollipop man, 2 refuellers, 1 fire extinguisher. The procedure involves a refuel, tire change and check at the same time, parallel driver change, where applicable. The speed limit is 60 km/h no matter the track. 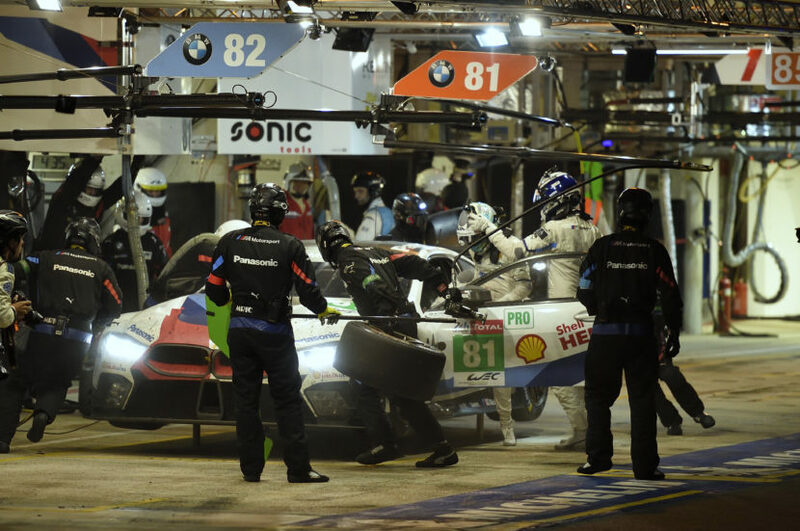 The challenge in FIA is the consistency of the pit stops throughout the entire endurance race. The perfect communication between driver, pit crew and engineers, particularly in the case of unplanned stops, are crucial. Then on top of that is the challenge of changing brakes in a 24-hour race. “Pit stops in the FIA WEC are a real challenge because we need to change the drivers more quickly than the 35 seconds that it takes to refuel. Getting out, getting in, and in particular, the new driver buckling up properly and securely in 25 seconds is far from easy. Training for these procedures is one of our most important tasks ahead of the race,” says Antonio Felix da Costa. 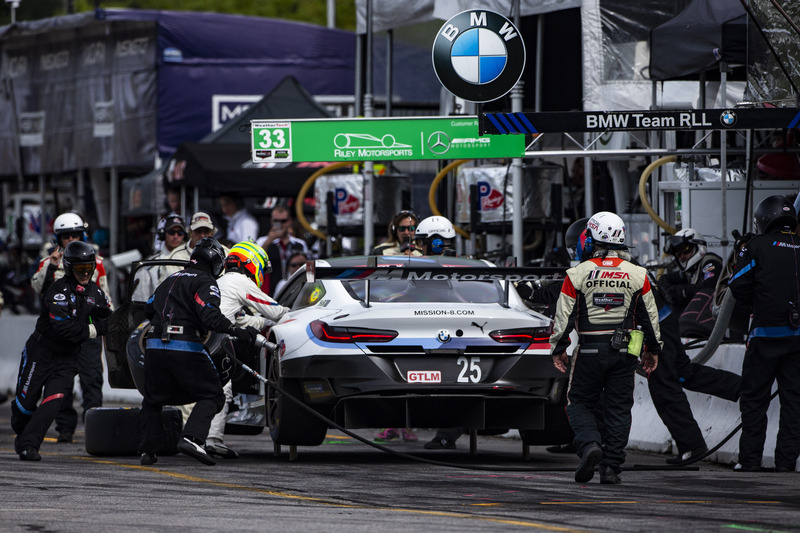 When it comes to the IMSA WeatherTech SportsCar Championship, in contrast with all the European race series, there is a pit wall in the USA, which everyone involved in the pit stop has to jump over before springing into action. The main factor is the consistency and safety of pit stops in line with prior planning. That’s why the team practices pit stops and procedures in every session, and all team members work on their physical fitness. The regulations allow you 34 seconds for full refueling, not limited when fuel quantity is lower, tire change 16 seconds, driver change 20 seconds. There are 4 team members at the car (3 tire changers, 1 refueler), plus the second driver, who helps with getting in and buckling up. Procedure: Refuel, change tires and check at the same time, parallel driver change, where applicable, start the car after tire change, during refueling. In the Blancpain GT Series, namely the 24-Hour race of Spa-Francorchamps, the challenge is sticking to the predefined minimum pit stop times as closely as possible so that you don’t lose any time, and timing the pit stops in the race to perfection strategically and tactically, for example during yellow flag or safety car periods. This applies to the predefined technical stop between the 10th and 15th hour of racing, which must take a total of five minutes, including entry and exit, and ideally is used to change the brake discs. Also, in each quarter of the race (once within six hours), the team has a joker pit stop, for which no minimum duration applies. Ideally, you can gain 10 to 15 seconds in these stops. In this case the car will be stationary for about 35 seconds (depending on the volume refueled). The organizer defines a minimum duration for the entire pit stop, including entry and exist for each track (in Spa it is 1:50 minutes). A team made up of 8 members in the pit lane (1 lollipop man,1 windscreen washer, 2 tire changers, 3 people for refueling, holding the hose and fire extinguishing, where applicable, 1 brake controller) and another 4 mechanics for taking the tires into the pit lane is used here. The procedure: Refuel, change tires and check all at the same time, driver change in parallel, where applicable.